Do you know how to kick off a project effectively? Are you confused about what you should cover in your kick off meeting presentation? Project Kickoff will show you how to run a successful kickoff meeting in simple steps. If youâ€™re a project manager who leads teams on customer-facing projects, then this book is for you. Itâ€™s a super-short book thatâ€™ll help you spend less time on preparing for your kickoff meeting, and more time on delivering it. It also includes downloadable templates and scripts that will help you save time. What to include in your project kickoff agenda, and who to share it with before your external kickoff meeting. How to list out the project goals, along with your project assumptions and constraints to avoid any potential miscommunication down the line. The best practices of including a team organization chart and a high-level schedule so that you manage expectations the right way. Why you should cover a change management process and communication plan. How to end a project kickoff meeting properly by including a next steps section and a Q&A session. The most important thing you should do after your project kickoff meeting ends. A downloadable sample project kickoff agenda and project kickoff template. 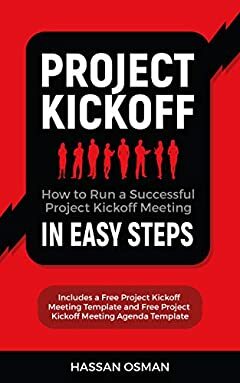 As a free bonus for purchasing this book, you'll get a Free Project Kickoff Meeting Template ppt (a PowerPoint file) that helps you save time in creating your own. You'll also get a Free Project Kickoff Meeting Agenda Template (MS Word format) that you can copy and paste and modify for your own team. Download Project Kickoff now to get started. Scroll to the top and click on the "buy button."